Burn your discs quickly and easily with AVS Disc Creator. Copy personal home audio in the original quality. Burn data in several sessions onto the same disc. Create your own disc cover with an integrated disc cover creator. Burn boot discs and create password protected file image formats (.daa, .uif). AVS Disc Creator supports CD-R/RW, DVD+/-R, DVD+/-RW, DVD-RAM, Double/Dual Layer DVD and Blu-Ray discs. Write your data to CDs, DVDs quickly and easily with AVS Disc Creator. Burn data in several sessions onto the same disc. 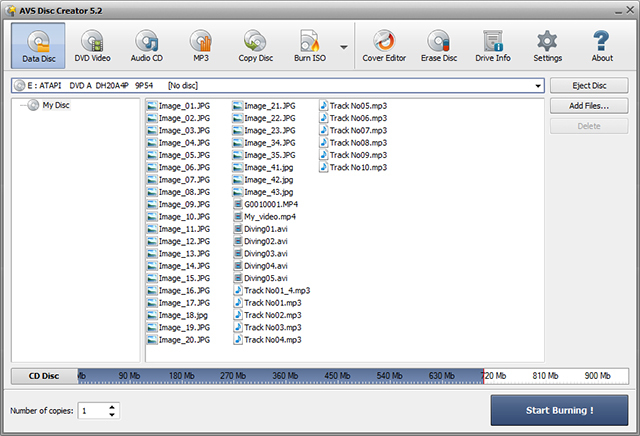 Make personal audio CD backups. Create your own DVD disc for home DVD Players. Burn DVD-Video files available on HDD directly to a DVD disc and watch a movie now with a home DVD Player. Create your own disc cover using a new integrated disc cover creator. Burn boot discs. Write your data onto Blu-ray (BD-R, BD-RE) discs. Store your data in the highest possible quality due to the unique BD data capacity of 25 or 50 GB per disc. Make an ISO image or a password protected file image and save it on your PC. Use any CD/DVD recording drives, software, designed and tested for IDE, SATA, SCSI, USB, and Firewire drives, works easily with most of them. AVS Disc Creator supports CD-R/RW, DVD+/-R, DVD+/-RW, DVD-RAM, Double/Dual Layer DVD and the latest Blu-ray technology BD-R and BD-RE. A recently updated simple and intuitive interface, a variety of hot features and supported media types make AVS Disc Creator the most convenient and demanded software to make home video DVD copies, create DVD/Blu-ray discs for home DVD Players and perform other burning tasks. AVS Disc Creator is a part of the AVS4YOU package. Register once and work with over 20 tools from the AVS4YOU.com. Subscribe for $39/year or $59/lifetime. AVS4YOU tools let you easily rip, convert and edit audio/video files, burn DVDs, create ringtones, upload videos to portable devices, players, phones and much more!